Former News of the World royal editor Clive Goodman had 15 copies of a royal phonebook when his house was raided in 2006, a court heard today. Head of telephony at Buckingham Palace Michelle Light told the Old Bailey that a special directory known as the “green book” is published twice a year. The book contains contact numbers for members of the Royal Family and staff. The trial heard that copies of the “green book” had been recovered from Goodman’s home in Addlestone, Surrey in August 2006. Goodman is charged alongside former News of the World Editor Andy Coulson with conspiring to commit misconduct in public office. Asked by Mark Bryant-Heron, prosecuting, if Goodman was a named recipient of any internal telephone directory, Ms Light said: "No." The books were supposed to stay on desks in the various royal households, and were not to be taken away. 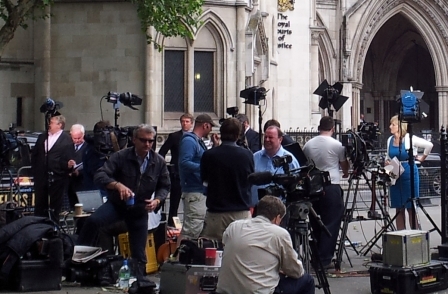 The court was told that a special internal “royal mail” service was responsible to issuing the books. Between 800 and 900 copies of the book are issued although it is impossible to determine who was issued an indivudual volume as there are no identifying marks. Bryant-Heron told the court it was an admitted fact that when Goodman's home address was searched on 8 August 2006, 15 royal directories were seized. Goodman and Coulson, 45, from Charing, Kent, face two allegations that they conspired together and with other unknown people to commit misconduct in public office between 31 August 2002 and 31 January 2003, and between 31 January 2005 and 3 June 2005. Coulson is also accused of conspiring to hack phones between 3 October 2000 and 9 August 2006. That charge is also faced by former NoW and Sun editor Rebekah Brooks, 45, of Churchill, Oxfordshire, Ian Edmondson, 44, of Raynes Park, south west London, and former managing editor Stuart Kuttner, 73, of Woodford Green, Essex. Brooks also faces two counts of conspiring with others to commit misconduct in public office – one between 1 January 2004 and 31 January 2012, and the other between 9 February 2006 and 16 October 2008 – linked to alleged inappropriate payments to public officials. She also faces two allegations of conspiracy to pervert the course of justice – one with her former personal assistant Cheryl Carter, 49, of Chelmsford, Essex, between 6-9 July and 2011, and a second with her husband, Charles Brooks, and former News International head of security Mark Hanna and others between 15 July and 19 July 2011. All of the defendants deny all of the charges.